Not sure what to get your photographer friends or family for Christmas? Maybe you got a gift card from a bookstore and your not sure what you should read. With Christmas fast approaching I thought I would recommend a couple of photography books that I read this year. Having a long commute on public transportation affords me plenty of time to read. At almost two hours door to door I can only listen to music so much, stare out the window at the vapid landscape along the New Jersey turnpike, doze off in hopes of catching up on sleep or think about retirement for only so long. With that kind of time I go through periods were I can plow so through many books. As a photographer, I think it’s important to know about photographic history and also how other artists see themselves and the work they do. What drives them? What are their motivations? What is there historical significance? With that in mind the following books are two very good reads. 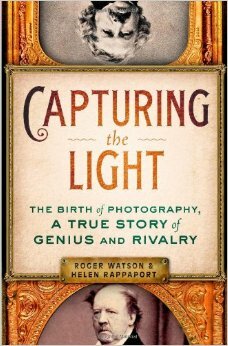 Capturing the Light by Roger Watson and Helen Rappaport: an interesting historical account about the development of photography as a science and then as a trade. It recounts the beginnings on all fronts and the competitive nature of the burgeoning technology. If you have an interest in early photographic history, the author paints a vivid portrait of the times and people involved in the creation of this amazing medium. Nights of the Shadow Catcher by Timothy Eagan: if you don’t have the opinion like I do that Edward Curtis is one of the most important photographers that ever lived than this book will change your mind. Edward Curtis is famous for photographing and documenting the western American Indian tribes and their customs. The book tells the story of his amazing life, his interests, not to mention his trials and tribulations. If you read this book you will have a greater appreciation of Curtis as an human being and certainly as an artist. I’m sure he never completed his life’s mission to the extent he wanted to but never the less this is an incredible story of an artist and his life. Has anyone else read these books? Let me know what you think. This entry was posted in Photographers by Larry Zink. Bookmark the permalink.